Marc Taggart and Company furniture is collected by the discerning, the difficult to please, those who insist upon and accept nothing but the very best. Each reproduction is hallmarked, registered, signed by the craftsmen who create it and numbered to facilitate its future authentication. The result is the closest replica of the original in the world. The Molesworth style was characterized by a great variety of leg and arm treatments, treatments which lend a distinctly Western flavor. Below we have displayed examples of classic Molesworth styles. 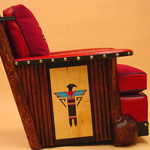 Burl club chair with routed and hand painted panel, half rounds and Chimayo weaving. 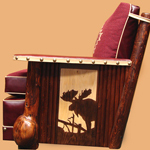 Burl Club Chair with burl arms and Chimayo weaving. 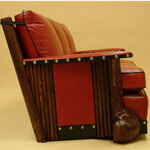 Three cushion burl sofa all leather with leather panel and half rounds. 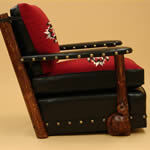 Burl Club Chair with Half Round Sides and Chimayo weaving. 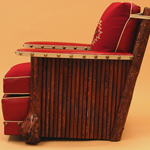 Burl club chair with paddle arm and open side with Chimayo weaving. 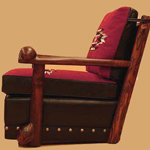 Burl club chair routed silhouette half rounds and Chimayo weaving. We guarantee our furniture’s structural integrity for as long as you own it. If it should fail under normal use at any time, we will repair it, or if necessary, replace it without charge. Simply return the damaged furniture, freight prepaid. We’ll then ship your new or repaired piece F.O.B. our workshop. Interpretations of the highest quality, in the Molesworth Tradition . . .
What do we mean by The Molesworth Tradition? Hallmarks of Molesworth design are: natural materials, grand stature, and the clever juxtapositioning of traditional woodworking craftsmanship with romantic thematic elements. Molesworth included certain design elements that are a signature of his style. If Molesworth were alive today,and had access to the same materials that we have available – how would he incorporate them into his furniture? This question and our extensive understanding of Molesworth’s work, guides us in interpreting the use of these new materials in his traditional manner. Marc Taggart & Company can create furniture and accessories in the Molesworth Tradition using the finest materials and craftsmenship. Suggest your own theme and prepare to fall in love with a custom designed piece done in the finest Molesworth tradition. How may we be of service?